… her skirt is tucked into her pantyhose on the first day of college … a well-known DJ becomes homeless … money goes missing from his teepee … a midwife drives in the polar vortex 2.5 hours at 3 a.m. to deliver … he runs to ease his soldier brother’s passing … her family saves money by driving a deceased grandma from Virginia to Traverse City for burial … superstition displaces skepticism when some mojo leads to his big Kentucky Derby payout … giant spiders live in her Peace Corps hut … she uses early guitar lessons to help her write love songs about Michael J. Fox … Meet Here:Say Storytelling, Traverse City’s surging live performance happening. This article is featured in the October 2017 issue of Traverse, Northern Michigan’s Magazine. Get your copy! The year was 2009, and Karen Stein, then a recent transplant to Traverse City, wanted to do live storytelling in her new town. But that type of performance didn’t fit the format at any of TC’s open-mics: they were all for musicians only. The one time she did learn of a reading event, she learned it happened only once because nobody showed up—it was a bust. Karen is a professional writer; she writes for a clinical publication. Her job requires objective and precise writing, as well as considerable creative constraint. But Karen’s “writing voice,” which she honed as a creative writing grad student, would seep into her technical assignments nonetheless. The work became her own in small ways, but her voice was only a whisper among the paragraphs of technical writing, and she couldn’t help but think how much louder that voice might be if provided a true storyteller platform. So in October 2013 Karen launched a monthly live storytelling series she dubbed Here:Say, basically TC’s version of Moth Radio. Each show features five to eight volunteer storytellers; their stories last about 10 minutes and play off of a show-specific theme. The performers are on stage, under a spotlight, with a microphone. The houselights are down. The crowd is quiet … listening hard. The show shares an element of edginess with standup comedy. Stories mix humor and poignant reflection, share raw, up close memories, vulnerabilities and transformative moments. 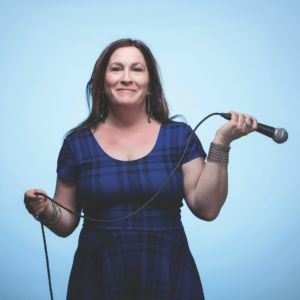 In giving birth to Here:Say, Karen became the torchbearer of a Traverse City storytelling movement. The name “Here:Say” is a pun on the word hearsay, and though both terms share the same pronunciation, their connotations differ. Hearsay is information that’s transmitted without any verifiability. It’s a slight step up from gossip or rumor. It’s illegitimate. Here:Say, though, is told straight from the source, and its authenticity counts. These stories are not fables or yarns. They are stripped of all pretense, and thus immediately relevant and engaging. There’s no saying, “Well, it was just a story.” To say that would, in a way, trivialize the storyteller and his or her perspective. To say that would be dehumanizing. Here:Say’s infancy was not without its growing pains: Early on, Karen found people who wanted to tell stories, but were hesitant, wanting to see a show before signing on. She had to lobby and cajole them to simply give it a shot. But Here:Say’s foothold in Traverse City’s social scene has firmed. The program returns to the Workshop Brewing Company this autumn for its fifth season; the third Monday of the month from October through May. Proof of Here:Say’s traction: the Workshop is packed on Here:Say Monday nights in the dead of winter. As the program’s creative director, Karen curates the shows and shepherds storytellers of all stripes as they prepare their stories. “I use my knowledge as a writer, editor, and former writing instructor to help performers develop their stories for stage,” she says. Some of the coaching is big picture stuff … theme, clarity, structure. Other advice is tried and true tips, dos and don’ts, tightening of loose ends. Writing a presentable short story for the stage requires discipline and self-reflection. For Karen, the storyteller’s journey begins with the end in mind: Why are you telling this story? A story begins as a jumbled collection of images, emotions and motivations that must be distilled into something comprehensible and engaging. Knowing why a story ought to be told is the first step toward knowing how it ought to be told: it permits the storyteller to both dispense with the extraneous and concentrate on what makes the story important in the first place. Elon Cameron became an early supporter of Here:Say, and she encouraged Karen during the program’s inception. 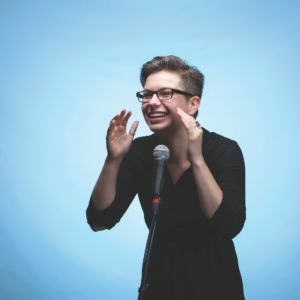 When she lived in Chicago, she was a founding member of the Bailiwick Theater’s Dyke Mic, a weekly spoken word event and has performed at Fringe Festival in Minneapolis and Ladyfest Midwest, so she understood how Here:Say could provide a type of stage that was lacking in Northern Michigan. At Here:Say’s inaugural show she told a story, and has performed regularly since. Elon sometimes finds her professional and personal lives intersect at Here:Say events. An acupuncturist by day, she methodically pierces her clients’ skin with tiny, ameliorative needles. During storytelling performances, she pierces their emotional veil, relating stories of her childhood in Traverse City and her tenure in Chicago, which began when she enrolled as a printmaking and photography student at the School of the Art Institute of Chicago. Elon delivers her stories in a style that can be fairly described as undiplomatic. If she shows little self-restraint during Zumba, then she exhibits even less self-censorship during a Here:Say performance. People she knows have come to the show, heard her story, and react “like, ‘Well, golly. Wow. Huh. What about you?’ ” she says. When she was growing up, Elon’s family didn’t have a television, but she would listen to a small radio that she got at a garage sale. The radio gained her access to an unseen world of stories and perspectives. It’s logical that Elon gravitated first to radio, then later to spoken word, and then later yet to storytelling: all three mediums are essentially aural, and they demand more from the audience’s imagination than the likes of, say, television. To Elon, storytelling doesn’t forge a connection between an audience and a speaker so much as expose a connection that already exists. Storytelling wouldn’t work if we didn’t already share the ability to create and understand the stories we exchange. When a Here:Say performance wraps, when the audience’s applause finally fades and the dimmed lights return to full-strength, there’s a warmth that lingers. It’s as if everyone’s heart is beating in sync. In these moments, as attendees settle their tabs and say their goodbyes, Jonelle Bowers can often be seen chatting with a member or two of the audience. They will have approached her. They thank her for sharing her story, and sometimes begin telling their own stories. Jonelle’s first public storytelling performances were on the Here:Say stage, and, initially, these brief interactions were colored by a post-performance adrenaline rush coursing through her veins. But experience has allowed her to relax and absorb the moment, and she listens attentively. “It takes a lot of bravery for audience members to come and want to share something of their own,” she says. Jonelle’s life has been, by her own admission, “a little bit dicier” than those of her storytelling peers. Her stories are heartbreaking and breathtaking. They explore themes of addiction and trauma, but also of recovery and reconciliation, of strength. The individual moments that cohere into Jonelle’s stories are not always her proudest. “It’s not pretty a lot of times,” Jonelle says. “I didn’t act graciously, and I fumbled a lot.” She is a flawed character. Her stories are meditations on the silent forces in all of our lives. Her perspective is a lens through which audience members can see their own stories in a new light. Her foray into storytelling began as a means to get back into writing; after having kids, writing became an afterthought. She signed up for a Here:Say slot knowing that she’d deliver on the event’s hard deadline. Yet storytelling has become more than just a creative outlet for Jonelle. 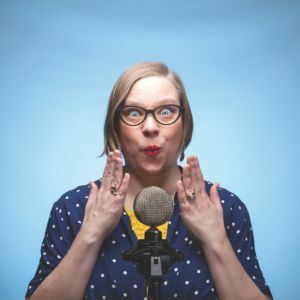 She took a story she first performed at Here:Say and told it on RISK!—a million-download-a-week storytelling podcast that has featured the likes of podcaster Marc Maron and comedienne Sarah Silverman. She also applies her storytelling skills in her career as a fundraiser for a Northern Michigan arts nonprofit. 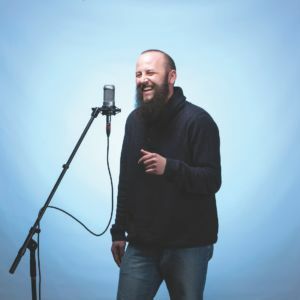 Matt Soderquist would sit in the front seat of his parked car and have “driveway moments.” Having just arrived home, he’d turn off his car and silently listen to a public radio storytelling program that outlasted his commute. While the engine clicked and pinged under the hood, he’d hear stories of people he’d never meet doing things he’d never do. He wasn’t invested in their lives—they just happened to be on the radio—but he’d listen anyway. And he would start to sob. Matt is familiar with stories that many of us are fortunate to only learn about from a distance. He’s spent the last decade investigating child and adult abuse and neglect as a social worker. Though such work is by its nature emotionally charged, the job fosters a certain level of detachment. “I found that if you do child protective services long enough, you become cold, and you have to, necessarily,” Matt says. He is soft-spoken and thoughtful, and his beard conceals an easy smile. Storytellers inhabit a space of shared vulnerability. They unravel more than a story’s plot twists and introduce an audience to more than its characters. To connect with his audience, a storyteller must bare his raw humanity to the benefit of his audience. Something about the stories on the radio melted Matt; what was once detached became reconnected in a teary-eyed instant. He had heard of Here:Say and emailed Karen to see how he might become involved. He pitched her a few stories over coffee. “I think I said about 10 words of one of my stories and she said, ‘Yep, you’re in!’” he says. They continued the conversation, fine-tuning the story structure and delivery. Matt can tell you how storytelling has affected his relationships with those to whom he’s closest. He can tell you how he’s been able to connect with his children by sharing anecdotes from his own childhood. As both a divorcee and the son of divorced parents, Matt’s childhood memories validate the complicated feelings his children have. Matt volunteers with a veterans nonprofit, and he can tell you how storytelling has provided a space for veterans to let their guard down, and for them to learn to heal their moral injuries together. He can tell you how love and healing and community can find their beginnings in storytelling. October 16th – Go Here:Say, It’s Your Birthday! All shows are held at Workshop Brewing Company (221 Garland St., Traverse City). Interested in telling a story on the Here:Say stage? Visit HereSayStorytelling.com to learn how to pitch a story, and, while you’re there, find links to audio recordings of previous Here:Say performances. Evan Perry is a former web editor for MyNorth.com and is now a Realtor and performance venue manager. evmaperry@gmail.com // Michael Poehlman is a Traverse City-based commercial, portrait, and fine art photographer. Check out some highlights at michaelpoehlman.com. Listen to this powerful Here:Say podcast about homelessness in the Traverse City community and beyond.